MV Marco Polo sails to The Similan Islands and Richelieu Rock for 6 days & nights, and gives its divers 22 dives per trip. Up to 14 guests join each cruise, and while most are certified divers, non-diving guests are welcome to join at a discounted rate. The boat is 23 metres in length and it has a very good reputation and lots of repeat customers. There are seven cabins on Marco Polo, each accommodating two guests. Three air-conditioned cabins have double beds. 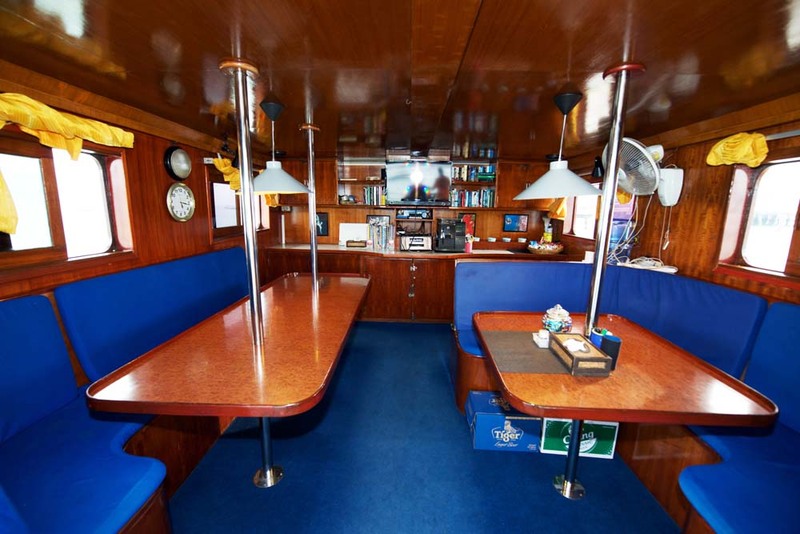 Two of them also have a spare single bed, and the third is the spacious honeymoon suite at the front of the boat. The four twin bunk cabins have fans, and all are clean & comfortable. Showers and toilets are all located on the same deck as the cabins. This is also where the large well-designed diving platform is, with an extremely-quiet compressor, plenty of tank slots, and Nitrox facilities. EANx certified divers get free Nitrox 32% fills throughout the trip. On the upper deck is where guests eat and socialize. There is an indoor lounge saloon. Here is where great food is served throughout the cruise, and includes western and local cuisine, all freshly cooked every day. However, most guests decide to enjoy their time outside on the same deck. Here we have a covered area with several tables and seating. Guests can enjoy the sea breeze and beautiful scenery while chatting in small or larger groups, or even relaxing alone. There's also a sundeck on the roof of Marco Polo that has soft mats and is partially shaded. The 22-dive trips on Marco Polo allow enough time to enjoy all of Thailand’s best diving sites without having to miss any out or race from one to the next. 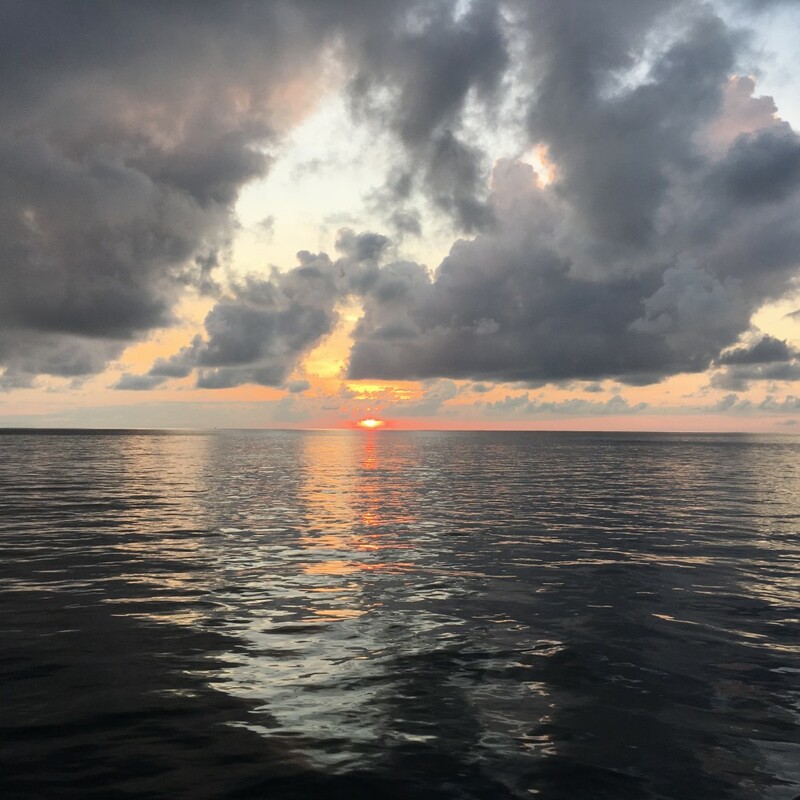 Unlike most other Similan diving liveaboards which sail from Tab Lamu in Khao Lak, Marco Polo sails from the south of Phuket in the evening. This has two advantages, which are guests from Phuket do not need a long journey by road, and Similan Islands #1 & #2 are on the itinerary. 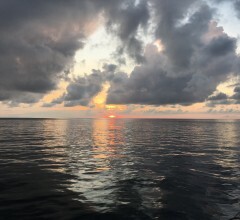 Normally, Phuket guests joining a Similan liveaboard cruise are taken by road to Khao Lak, which can be more than 2 hours in a minivan that also picks up other divers. But Marco Polo departs from Chalong in Phuket, so you can sail into the night, but don't miss out on any diving because the boat reaches the dive sites before dawn. In addition, liveaboards that sail from and back to Khao Lak don't visit the southernmost Similan Islands, but Marco Polo can because these are en route from Phuket. These areas include Sharkfin Reef and Boulder City. The amount of time aboard also enables divers to take part in diving courses, such as the Advanced, Nitrox and others. For anyone wanting to fully immerse themselves in the best diving in Thailand, and staying on board with not too many other people, Marco Polo is a great option. Marco Polo sails directly from Phuket in the evening of the departure day and returns at around 6.00pm on the final day of the cruise. Guests can be picked up from various locations in Phuket during the late afternoon. Paperwork and final payment are taken care of at the dive centre or on the boat. This is also when equipment is checked. After being allocated cabins and introduced to the crew and safety procedures, guests enjoy dinner on board while getting to know one another. Sailing northwest into the night, the boat arrives at the dive sites in The Similan Islands at about midnight, allowing everyone on board to get a good night’s sleep before the diving starts first thing in the morning. The first dive of the trip is always at an easier dive site, and known as a 'check dive’. The Divemasters, instructors and cruise leader make a better and final decision of who will dive with who, using their assessment of each diver’s confidence and air consumption. Of course, couples and friends often want to dive together, and this can be discussed on that morning. There are four dives per day, including a night (or sunset) dive. Meals or snacks are served before, between & after every dive, and there are excursions to beaches and snorkelling reefs when possible. Each trip’s diving starts and finishes at the Similan Islands, but during the middle of the cruises Koh Bon, Koh Tachai & Richelieu Rock are dived. On the final day of the cruise, there are two morning dives before Marco Polo sets sail back to Phuket, arriving around 6.00pm. Dive Deck . 24 M2 (260 Ft2). Cabins. 7 (1x Double Air Con., 2x Double/twin Air Con., 4x Twin Fan). Electricity. Every Cabin Has 220v Outlets With Electricity 24 Hours A Day. Oxygen. 50 Litre Oxygen Tank. Central Compressor Station. ( 400 Litres/minute ) (virtually Noise-free Tank Re-fillings). Compressors. 2 Bauer Mariner Compressors. Safety. GPS, Dinghy, Life Raft, Telephone. Entertainment. TV, Video & Hi-fi. Spending nearly a week on a liveaboard diving boat cruise boat is a once-in-a-lifetime opportunity for most of us. Doing so while sailing to and from some of the best diving spots in the world, and certainly the best in Thailand, is even more enjoyable. During Marco Polo’s 22-dive liveaboard safari, some guests increase their total dive count by more than 100%, gaining more experience and love for the hobby each time they descend below the waves. Others have 50-100 logged dives or more, but still want to increase their certification level or skills. Taking part in a diving course onboard Marco Polo is a very popular choice for many of our guests. Affiliated with both PADI and SSI, the multilingual instructors on Marco Polo are able to offer great-value courses during the cruise. The most-commonly taken courses are Advanced Open Water Diver and Nitrox (Enriched Air). Some guests even do both! The Advanced Open Water can be done in conjunction with PADI or SSI at a competitive price of 7,500 THB, as well as the SSI Advanced Adventure Diver. The SSI Deep Diver Specialty is just 4,500 THB, too. Finally, with Nitrox fills for free on Marco Polo liveaboard cruises, it makes a lot of sense to take the EAN (Enriched Air Nitrox) course at just 7,500 THB. Please let us know which course you may be interested in taking part in aboard Marco Polo and we will give you a prompt and competitive quotation. Please note that PADI courses are subject to a surcharge for materials, but this is not the case with SSI courses. Free transfers are available on departure and return days. These are at fixed times and dependent on the location/destination of the guests. Most hotel zones in southern Phuket are within the zone. Prices are ‘per diver’. Non-diving guests receive a 10% discount on the above rates. Prices are inclusive of accommodation and all meals. Also included are Divemaster guide services, 12-litre tanks, weightbelts & weights and Nitrox fills (for certified divers). National Marine Park fees (2,200 THB) and equipment rental (if required) are not included. On-board payments need to be made in cash.